Currently, the United States is the largest recipient of FDI in the world. In 2010, FDI into the U.S. economy increased to $228 billion from $153 billion in 2009.While the United States has enjoyed this leadership position for decades, the share of FDI to the United States is decreasing. 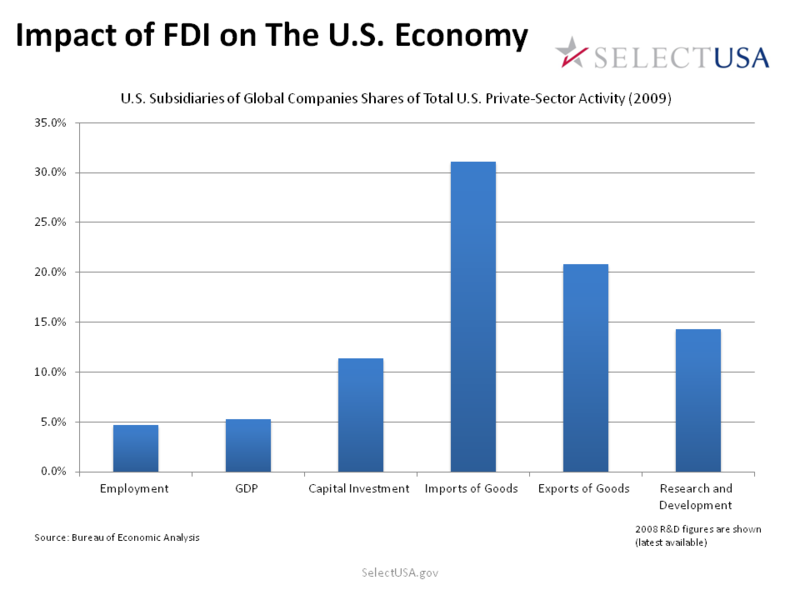 In the 1980s the FDI in the United States accounted for nearly 45 percent of the all foreign direct investment. Today, the United States accounts for less than 15 percent of total FDI flows. At the Department of Commerce’s International Trade Administration (ITA) we are working to promote foreign direct investment in the United States because it is significantly impacts U.S. exports and jobs. U.S. subsidiaries of foreign companies are responsible for about 21 percent of all U.S. exports and support more than 5.3 million U.S. jobs – that’s about 5 percent of all U.S. employment! Since taking office, the President has emphasized the unequivocal policy of openness to both foreign and domestic companies that invest in America. SelectUSA, which is housed within ITA, was created by President Obama in 2011 through an Executive Order to promote business investment in the United States. And there is more. SelectUSA promotes the benefits of investing in the United States, including a strong system of intellectual property rights protection; unparalleled global access through trade agreements representing access to nearly 610 million worldwide consumers; and nearly 36 percent of global research and development expenditures taking place in the United States. Companies and organizations use these services to help make business investment decisions when exploring the U.S. economy. One of the companies in attendance at the White House forum, Canada-based AGS Automotive Systems, is a recent SelectUSA success story. The Company announced plans to manufacture bumper systems at an expanded facility in Michigan with an investment of $20 million. Through the Commercial Service Canada’s introduction, SelectUSA met with AGS Automotive during its outreach visit to Toronto in September, 2011. Since then, SelectUSA has worked with AGS Automotive as the company evaluated its location decision among various options across North America. Financial assistance and incentives offered by the State of Michigan were also pivotal in AGS Automotive’s investment decision. With these plans, the company will create 100 direct new jobs and retain its 50 existing jobs in the U.S. automotive sector. The pilot countries will be: Brazil, Canada, China and Hong Kong, France, Germany, India, Mexico, Russia, South Korea, and Spain. Maintaining America’s industry competitiveness is an ongoing endeavor; however, with programs like SelectUSA, it’s much easier for companies of all sizes and from all business segments to make a sound decision to locate operations here.